In the journal of her trip to India in 1953, the Brazilian poet Cecília Meireles writes: ‘As paradoxical as it may seem, it is easier to understand the East (India) by knowing Brazil, whose problems are curiously similar (struggle for the affirmation of nationality, urgency to adapt to international circumstances, use of wealth, racial setbacks, economic consolidation, education plans), except for their respective ages and the date of their independence[i]. By exploring the potential territory of dialogue that is represented by the poet’s intuition, we witness a fascinating situation. Brazil and India are complex societies with a large territory and population and these countries are regarded, from the historical point of view, as antipodes in birth: India, one of the oldest civilizations of humanity and Brazil, one of the youngest. At the same time, they present a remarkable common characteristic: a content of unity that articulates, intrinsically and organically, a cultural diversity. In other words, they are societies that have two fundamental implications: (i) a dynamic of inclusiveness, a cultural permeability that is, at the same time, matrix of genetic constitution and matrix of historical interaction with external agents; (ii) a dynamic of the imaginary, as an essential structure of articulation of the cultural diversities that confers plasticity and iconographic profusion. This underlies, on the one hand, a postcolonial environment relatively immune to the Cartesian-Enlightenment rationality and, on the other hand, a natural disposition for intercultural dialogue, which emerges as a spontaneity that reinforces and guarantees the continuity and survival of a civilization. It is within the scope of literature, a privileged sphere of sense building, that the potential of Brazil-India dialogue reaches its most exuberant expression. Although clearly unsystematic, this dialogue registers significant events, both with regard to the presence of Brazilian literature in India[ii] and, especially, with regard to the presence of written and oral sources of Indian literature in Brazil. With respect to the latter, we can identify, initially, a level of predominantly oral subconscious presence, represented by the incorporation of the Indian narratives of the Pañcatantra in the popular folklore of the Brazilian northeast[iii]. Another level, of a more conscious and written character, is represented by an extensive group of Brazilian authors who, through the most diverse and distinct regions of Brazil, came into contact with the ancient literature of the Vedas, Upaniṣads, Vedānta, Yoga, and Buddhist sutras, and the contemporary literature of key personalities such as Mahatma Gandhi and Rabindranath Tagore. This is the case of Cruz e Souza, Augusto dos Anjos, Machado de Assis, Guimarães Rosa and the modernist writers associated with the Festa group, in which Cecília Meireles stands out, whose philosophical lyric is fundamentally constructed in the light of a sui generis with Indian spiritual sources[iv]. It is in this context, therefore, of the enrichment of the still incipient dialogue between Brazil and India in the sphere of literature, that the importance of the translation of 100 Great Indian Poems (Bloomsbury India, 2018), edited by Abhay K. into Portuguese titled 100 Grandes Poemas da Índia stands out. Abhay K. is an Indian poet-diplomat currently based in Brasilia who has received SAARC Literary Award 2013 for his contribution to the South Asian poetry. He has also edited CAPITALS, a poetry anthology on the capital cities of the world and has published six collections of poems. 100 Grandes Poemas da Índia, has been published as a special edition of Cadernos de Literatura em Tradução, a reputed journal of literature in translation by the University of São Paulo. This edition is entirely devoted to Indian poetry. It is undoubtedly a very important contribution to the cultural dialogue between Brazil and India and a unique opportunity for a radical encounter with the multiple facets of the civilizing soul of the Indian subcontinent and its cultural, social and religious expressions. …. When Buddhism sought to reform Hinduism, Hinduism turned around and sought to absorb it too, by including the Buddha as a reincarnation of Vishnu and his agnostic teachings as merely a nastika form of the mother faith. As a result Buddhism has hardly any strength or presence in the land of its birth, having been absorbed and overtaken by the religion it sought to challenge. Hinduism could well have tried the same with Christianity and Islam, too, had it been allowed to do so; but these faiths were not interested in being embraced by Hinduism, since they saw themselves as the revealed Truth rather than as one among multiple versions of truth. Hinduism is also unusual in seeing God, Man and the universe as co-related. As the philosopher Raimon Panikkar has explained, in Hindu thought, God without Man is nothing, literally ‘no-thing’; Man without God is just a ‘thing’, without meaning or larger purpose; and the universe without Man or God is ‘any-thing’, sheer unexisting chaos. In Panikkar’s explanation, nothing separates Man from God; ‘there is neither intermediary nor barrier between them’. So Hindu prayers mix the sacred with the profane: a Hindu can ask God for anything. Among the tens of thousands of sacred verses and hymns in the Hindu scriptures are a merchant’s prayer for wealth, a bankrupt’s plea to the divine to free him of debt, verses extolling the union of a man with a woman, and even the lament of a rueful (and luckless) gambler asking God to help him shake his addiction. Prayer and worship, for the Hindu, are thus not purely spiritual exercises: they enhance the quality of his life in the material world, in the here and now. Hindus are often asked, during certain ritual prayers, to imagine their ishta-devta, their personal God, or rather that way of imagining the abstraction of the Absolute in an anthropomorphic form that most appeals to them. I pick Ganesh, or Ganapathi, as we prefer to call him in the South, myself, not because I believe God looks like Him, but because of the myriad aspects of the godhead, the ones He represents appeal most to me. This first novel by Roshen Dalal is ideal to read during a train journey or while waiting for a flight, when a cup of coffee and a racy book with intrigue and murder are sufficient to make the wait enjoyable. It begins with the introduction of the novel’s two main characters. Dev and Nityanand or Nitya. Devdarshan is Nityanand’s Guru and dying of AIDS. The initial few chapters, alternately, tell the reader the background of both Dev and Nitya. The story is Dev’s; Nitya is only a tool to unfold it, the foil to Dev’s negativity. Nitya comes down to see his dying Guru at his ashram in Rishikesh. Out of sheer ignorance he has stood witness in the court, swearing Dev’s purity and celibacy, facilitating unknowingly, the dismissal of all cases of sexual coercion against his guru. Nitya is angry with himself for betraying the innocent. He remembers the accusations of drug dealing, of guns and weapons, of murders and deaths, while he was in Dev’s ashram in the US. The story unfolds through Dev’s writings that he hands over to Nitya to read. That part of Dev’s life is a reminder of the recent shenanigans and expose` of several godmen in the country. It is quite apparent where the story is leading, yet the details of how ashrams are opened, how greed and weak minds can succumb to the lure of going to foreign lands – how women become easy victims of the Guru they blindly follow, keep the reader engaged. There was not one Jesus Christ but two. The first was the Jesus who was born of a virgin birth, who walked on water, turned water into wine, raised people from the dead, and was himself resurrected after death. But the second, and perhaps even more remarkable, Jesus was a real-life his­to­rical figure, who lived in Palestine circa 4 BC to 33 AD, and who arguably changed the course of world history more than any other living person. Of the first Jesus, we know a good deal, thanks to Biblical sources; of the second, we know almost nothing. 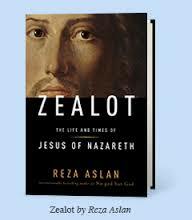 And that is something that author Reza Aslan sets out to address with this book.